Little Zombies: Swap Over: Stop complaining! Rating: Mehhh, if you're bored. Content Advisory: There could have been a religious exclamation or something similar. I can't remember. It was late. Maddy had a best friend who had everything, wealthy doting parents, attended an exclusive school, owned her own horse for gymkhanas, and she was well liked and popular as well. 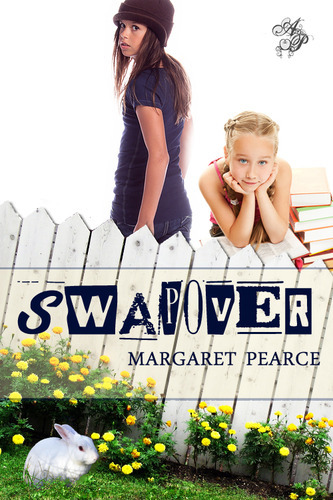 Maddy lived in an ordinary over crowded little house, with two unpleasant sisters who crowded her bedroom and her life. Her parents didn’t have enough money for anything extra and didn’t seem to care that she was missing out on all the good things in life. She attended an ordinary school with her sisters. Maddy’s wish that she could swap into Jennifer’s life is granted. So she has Jennifer’s privileged life, and Jennifer has her boring poverty struck life. So why is she still unhappy, and why is Jennifer still happy, well liked and popular? Robot's Review: I browsed this title from my library's overdrive account, not realizing that this is I guess an e-book only kind of book. Hmm. First off, I guess I was given the impression that this was a book about maybe upper elementary grade kids. Which made sense in the voice of the book/main character, but also didn't in a way. She's a whiney, annoying, egotistical girl. She has a friend the same age who's sophisticated and kind. Okay that's fine. But really, it's not fun reading about a whiney, annoying, egotistical girl-which I guess she's just annoying because she is whiney and egotistical and rude. Later we find out that they're in either 7th or 8th grade (or maybe I skipped the part where it made it obvious?). To add to the mix, the author is either from Europe or Australia (she did go to Monash...and the reason I know that's in Australia is my maybe future sister-in-law went there.) So there's lingo in the mix or just words it seems like we don't usually use in the US. Or maybe I'm just not as knowledgeable. It seemed more often towards the end of the book than the beginning (or maybe I didn't notice early on) but it seemed weird that all of a sudden it was a different speech. The book did seem to end abruptly. Again, those other book previews at the end of books can surely trick. I think the actual book ended at about 92% on my kindle. So let's get to the GOOD things. Still entertaining-ish. If you can get over the MC's voice. It seemed quite obvious to the reader that she needed to be just content and happy with her regular life before she could swap back lives. So if you dare to read this (did I help? =)), you can check it out from your library's overdrive account or you can buy it from Amazon for $1.99. Though I'm not sure I'd suggest this to my child in the future. Seriously, the whiney tone.